Dr. William Stallings authored 18 textbooks, and, counting revised editions, a total of 70 books on various aspects of these subjects. 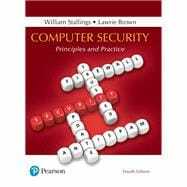 His writings have appeared in numerous ACM and IEEE publications, including the Proceedings of the IEEE and ACM Computing Reviews. He has 11 times received the award for the best Computer Science textbook of the year from the Text and Academic Authors Association. high-technology firms. He has designed and implemented both TCP/IP-based and OSI-based protocol suites on a variety of computers and operating systems, ranging from microcomputers to mainframes. Currently he is an independent consultant whose clients have included computer and networking manufacturers and customers, software development firms, and leading-edge government research institutions. He created and maintains the Computer Science Student Resource Site at ComputerScienceStudent.com. This site provides documents and links on a variety of subjects of general interest to computer science students (and professionals). He is a member of the editorial board of Cryptologia, a scholarly journal devoted to all aspects of cryptology. His articles appear regularly at http://www.networking.answers.com, where he is the Networking Category Expert Writer. Dr. Lawrie Brown is a visiting senior lecturer in the School of Engineering and Information Technology, UNSW Canberra at the Australian Defence Force Academy. During his career, he has presented courses on cryptography, cybersecurity, data communications, data structures, and programming in Java to both undergraduate and postgraduate students.